Active inclusion has a number of implications from a gender perspective: the gender disparities in exposure to poverty show higher rates for women than men and do so in a lifecycle perspective. This is partly due to women’s greater likelihood for slower, shorter and/or interrupted careers and on average lower earnings than men. Furthermore, the disadvantages faced by women of certain groups tend to be more accumulated than those for men from the same groups. 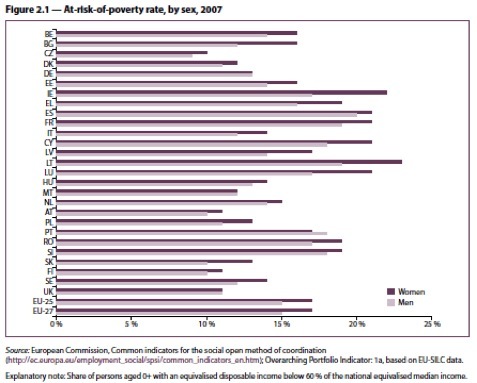 Finally, access to quality services (including childcare, long-term care and health services) is particularly important for the social and labour market participation of women who still have in many Member States the main responsibility for caring for the most vulnerable members of the household (children, elderly, sick and disabled). Although gender mainstreaming is specified as a key element of active inclusion policies and a requirement in the ‘Open method of coordination for social protection and social inclusion’, this approach to policy design and monitoring is still underdeveloped. The aim of this report therefore is to inform and help develop gender mainstreaming in active inclusion policies. In order to do this, the report at first reviews gender differences and inequalities in the risks of poverty and social exclusion and it provides a close look at the connections between active inclusion policies and gender equality strategies (Chapters 2 and 3). It then analyses examples of concrete gender mainstreaming in each of the three pillars of active inclusion, i.e. income support (Chapter 4), labour inclusion (Chapter 5) and access to services (Chapter 6). Under each heading, the report summarises available information on the actual policy developments and looks at the results of the policies in terms of gender equality. Finally, Chapter 7 draws some conclusions. The information in this report is mainly provided by the national experts of the EGGSI network of experts in gender equality, social inclusion, healthcare and long-term care and covers 30 European countries (the EU-27 Member States) and the three EEA–EFTA countries (Iceland, Liechtenstein and Norway).